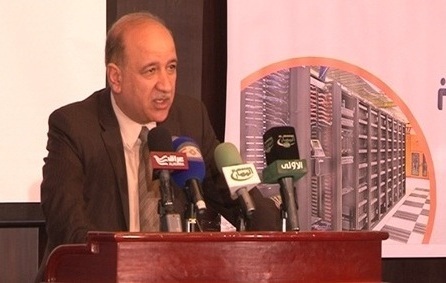 Under the sponsorship of his excellency the Iraqi Minister of Communication Dr. Torhan Al-Mufti, Fusion ICT organized "Prospect of Data Centers for eGovernment" in Baghdad in cooperation with Cisco Systems. This event was the first of kind in the capital Baghdad through which the latest technologies in Datacenter and Cloud Solutions were presented by Cisco Systems delegations. Senior Deputy Minister of Communications Ameer Al-Bayati announced that the Iraqi Government seeking to use information technology to serve the Iraqi Citizens and work to provide better services to digitize the community. Also Ministry of Communications is seeking to cooperate with the private sector and best practices to deploy eGovernment Solutions in country. On the same event, a representative from the Ministry of Defense highlighted the importance of providing those services under extreme security in order to avoid any data loose, hacking of systems or denial of service. From other side, Cisco Systems showcased the latest trend and updates on the Cloud computing and their Datacenter solutions that will support Iraqi Government to deploy the eGovernment initiative more easily and simple. Farook Al-Jibouri and Mohammed Al-Hashimi from Cisco presented two lectures (please follow link below). Redline Communications also presented the latest technologies to enable datacenter services to reach out to remote locations via highly secured and reliable wireless networks. Ziad Choueiry from Redline presented to the audience about Redline capabilities and the solutions they can provide to the Iraqi markets. The event was attended by around 160 persons, that demonstrates the high importance of the event subject and timing that come in congestion with announcing many eGovernment project in various government institutes. At the end Fusion ICT (Al-Insehar) thanks all the participants and sponsors to make this event a success and wish we will have our space and efforts to build proper ICT infrastructure and better citizen services via our company. برعاية معالي وزير الاتصالات د. طورهان المفتي اقامت وزارة الاتصالات بالتعاون مع شركة الانصهار للاتصالات والتقنيات الالكترونية وشركة سيسكو العالمية ملتقى افاق مراكز البيانات للحكومة الالكترونية بحضور السيد الوكيل الفني الاقدم امير خضر البياتي ومدير عام شركة الانترنت ومدير عام شركة السلام وعدد من ممثلي الوزارات الاخرى . يهدف الملتقى الى عرض احدث التقنيات والابتكارات في مجال مراكز البيانات ( Data center ) من قبل موفدين من شركة سيسكو . تحدث وكيل الوزارة الفني الاقدم امير خضر البياتي عن اهمية الملتقى واهمية عقد مثل هذه الفعاليات من مؤتمرات وورش لكسب الخبرة والفائدة لمختلف الوزارات العراقية وشركات القطاع الخاص والبنوك والقطاع العام . واضاف البياتي ان ربط مؤسسات الدولة بنظام شبكي لتطوير عملها وادخال التقنيات الحديثة فيما يخص عمل كل وزارة حسب مهامها ومسؤولياتها . وقال البياتي ان الوزارة تبنت بعض المشاريع الخاصة بربط المؤسسات للنهوض بهذا الجانب الحيوي وللوصول الى المستوى المطلوب اضافة الى دخول بعض شركات القطاع الخاص للعمل في هذا المجال حسب الخبرات المتوفرة لديها . من جانب اخر القى ممثل شركة سيسكو العالمية الرائدة في انظمة البنى التحتية ومراكز البيانات بالقاء محاضرة مبسطة وعرض توضيحي خاص بالمشروع منهيا ً محاضرته باهمية هذا المشروع الذي يهدف الى توضيح الرؤى والتطورات في مجال مراكز البيانات .